Professional writers often look down on bloggers, because their informal online writing rarely benefits from a good editor. Blogs are known for their casual writing and unpredictable subject material, but the best blogs have proven that — regardless of punctuation and spelling — even “novice” writers can be entertaining enough to attract a broad audience. Bloggers with an especially engaging subject, such as chronicling a trip around the world, have the advantage of inherently interesting material, but even mundane material can attract an audience if you have an engaging style and voice. Develop a writing style and tone appropriate to your subject material. Post often, even if your posts are short. Allow your readers to comment on your posts. A great site design and technical gimmicks are no replacement for developing an interesting, readable writing style. Most of us don’t do much personal writing in our everyday lives or even keep a diary. Writing about yourself is never easy, and you may find yourself freezing up in front of the computer screen or becoming stilted and unnecessarily verbose. 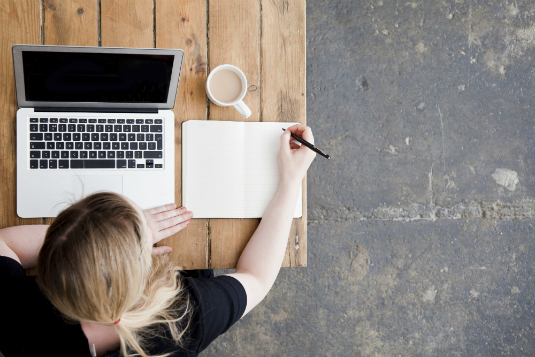 Here are a few suggestions you can use to develop your own voice and style for your blog. First, remember that a blog is a conversation. Try to write the way you speak. Avoid jargon and clichés and don’t overuse the thesaurus. It may be helpful to speak your entry out loud before trying to type it or to read it aloud after you’ve written it. If you find yourself struggling as you read aloud or speaking unnaturally, think about what you might have said if you were talking to a friend rather than writing. Second, write your blog with a specific friend or family member in mind. Thinking of someone you know well and who might want to read your blog will help you relax your writing style. That’s why it’s become popular for many people to start personal journal entries with Dear Diary. The goal is to get your writing to sound more like you and less like a lofty essay. Always consider your audience. If you’re writing for only close friends and family, you don’t need to explain that Sarah is your 8-year-old daughter every time you mention her. But if your blog attracts a wider audience, you may want to create references or glossaries to help new readers follow along. Finally, before you start blogging, spend some time visiting other blogs that are like the one you’re thinking of starting. Read one or two for a few weeks and pay attention to things like the length of posts, frequency, writing style, and subject material. You can get some great ideas for your own blog by noting what you find interesting and compelling in other people’s blogs. The blogs that attract the most readers are the ones with frequent updates. If you start a blog, be prepared to spend some time working on it every day or two. If you’re going to be a blogger, you have to blog! It takes discipline for most of us to write, even conversationally, every day. If you find yourself dreading posting to your blog, maybe a blog isn’t for you. As you go about your day, keep the blog in the back of your mind. You may even want to carry a notebook where you can jot down reminders for topics you want to blog about later. Start paying attention to the parts of your life that are most interesting to you; those will likely be the areas your friends and family are most interested in as well. Don’t be afraid to write about everyday activities — parking tickets and car repairs — but don’t neglect to talk about what you’re thinking and feeling. All these areas will make it possible for you to update frequently. Having a co-blogger can take some of the pressure off, especially if all authors contribute regularly. If you’re going to be working with several people on one blog, talk over how often you expect each other to post so that you can keep some focus and cohesion to your blog. If you will be updating your blog on a weekly, biweekly, or monthly basis, try to be consistent about when you add new posts so that your readers know when to catch up. For example, you may choose to update your site every Sunday evening. An important aspect of blogs is that they feature the writing of the blogger as well as the comments of readers. When you visit a blog, you often find a comment link under the text of each blog posting. Clicking that link enables you to read comments from other people and submit your own. Usually bloggers make their own comments in the posts on their site, but sometimes a blogger adds a response in the comment section because it’s a more direct way to address someone else’s comment. Not all bloggers choose to implement the comment feature, but if you want to develop a dialogue with your audience, comments are the best way to do so. The comment feature is an easy way to involve your audience and get valuable feedback about what you’re doing with your blog. If you do decide to allow comments on your blog, be sure to keep an eye on them. The comment feature makes it possible for anyone to add comments to your blog and you may not always like what they have to say. For example, spammers sometimes take advantage of inattentive bloggers to do some marketing that you may not want on your blog. All good blogging software makes it easy for the author to remove comments.